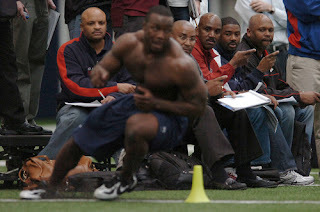 With the NFL Draft less than a month away, scouts are going crazy trying to evaluate each and every draft eligible prospect out there at each school's respective NFL Pro Timing Day, where the scouts come on campus to test the 40 yard dash, vertical jump, broad jump, short shuttle, 3 cone, bench press and positional drills. These "Pro Days" will be that last look at prospects before the draft and the last chance for athletes to make an impression. I have been busy here preparing my athletes for their pro days. Here is a look at some of the guys and the awesome results they achieved. 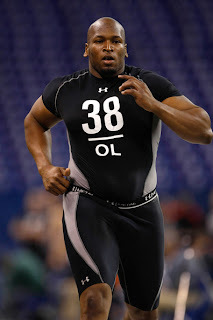 Eugene Monroe OT Virginia - At the NFL Combine Eugene ran a 5.16 40 yard dash, jumped a 9'4" Broad Jump and repped 225 lbs. for 23 reps. At his pro day he performed only positional drills but looked flawless. He has the best feet I have ever seen in an offensive lineman. Jacob Lacey CB Oklahoma State - ran a 4.42 40, vertical jumped 41" he is a riser in this years draft with his cover skills. 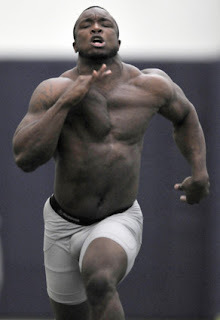 Julius WIlliams DE UConn - ran a 4.58 40, vertical jumped 41" and had 36 reps @ 225 lbs. Chris Baker DT Hampton - ran a 4.94 40 @ 326lbs., vertical jumped 35.5"
Others to watch over the next week are OT Sebastian Vollmer and DE Phillip Hunt from Houston.They should test off the charts! Various high school combines are in full swing, Under Armour, Nike/Sparq, and Schuman's leading the way around the country. If you are needing help preparing for these combines, be sure to get our Combine Freak DVD that will help you master the tests and sepearte you from the competition. For those of you looking to take your training to a higher level, take a look at my Speed Tools Training System. For the first 5 orders I will throw in a free DVD with exercises and drills using the gear I use with my NFL players. If you are having trouble running a fast short shuttle, let me help you. I see way to many athletes making the same mistakes over and over again at combines around the country. So many athletes I see try to side shuffle off the start. This leads to a slow start and a dissappointing time. Think of this... what's faster running or shuffling? Running is the fastest, so run and don't shuffle. The faster you can get out of your start stance and cover the first 5 yards, the faster your time will be. So crossover and turn the hips towards the line. This will get you there way faster than side shuffling to the line and keeping your hips toward the timers. If you have my Combine Freak DVD you know that I have over 17 minutes of instruction on this test alone teaching you all of the details you need to know. I just finished breaking down the footage from the NFL Combine, specifically the 40 yard dash. As you probably already know the times on a whole were slower than years previous. Some say it was the surface in the new Lucas Oil Stadium, which could have played a role. I was shocked to see some of the weird 40 yard dash start stances some athletes chose to use. If you watched the combine you would have seen some athletes stretching the back leg as far back as possible and keep it straight as a board. This to me makes no sense... You need to drive from both legs, but if that back leg is straight, you can't generate any power from that leg. So essentially you are killing your power off the start... Very odd and it showed in their times. With the 40 yard stance I teach my athletes, the back leg is bent and I coach them to drop that knee to the floor, about 4" up from the turf. This gives the more of a horizontal spine angle and allows them to drive out not up. This, to me is an important cue to running a fast 40 yard dash. If you have my Combine Freak DVD you probably could tell who trained with me, by their 40 yard dash technique, more specifically the breathing pattern we use to push acceleration as far as possible. If you have yet to get your hands on the DVD you can check it out here.